"Tap into that treasure box that is your deepest soul, and release those unique gifts and talents that make you a complete, dynamic human being." 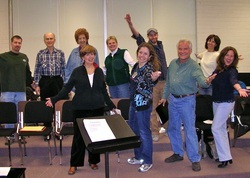 Happy Singers in my Joyful Singing Class! My Mission is to help empower my clients to lead fuller, happier, more successful lives using singing and voice work as a vehicle for personal growth and enlightenment. After years of work with singers and speakers, I’ve developed a holistic approach to voice therapy that gives you the skills to find your true voice, both physically and emotionally. Traumas, both physical and emotional can cause you to mask your true feelings, and after years of denial, it may be difficult to get in touch with your authentic self. As a Vocologist I can help you find that powerful, confident voice again so that you can ‘speak your truth', and shine your light in the world. With all of the responsibilities of everyday life, it's easy to forget about those things that once brought you joy. You may have put aside the dreams you once had; you may have chosen not to pursue your ‘heart's desire'. In order to be a whole person, living a fulfilled life, it's important to reconnect with those creative, altruistic, artistic passions that you may have denied. If you feel that an essential part of your being has ‘gone to sleep', it's time to wake up! The Lawrence Vocal System helps you unlock and tap into that treasure box that is your deepest soul, releasing those unique gifts and talents that make you a complete, dynamic human being. My ideal client is attracted to my 30 years of experience as a professional, award-winning singer/songwriter. That client is seeking expertise to further a professional career; get over a fear of singing; fulfilling a dream to sing at any stage in life; build confidence and health through singing. I know how to identify singer’s blocks and rehabilitate their self-image. I also mentor women in transition who need clarity and confidence in finding their new life's path. Please click on the button below for more information for positive mentoring and support!